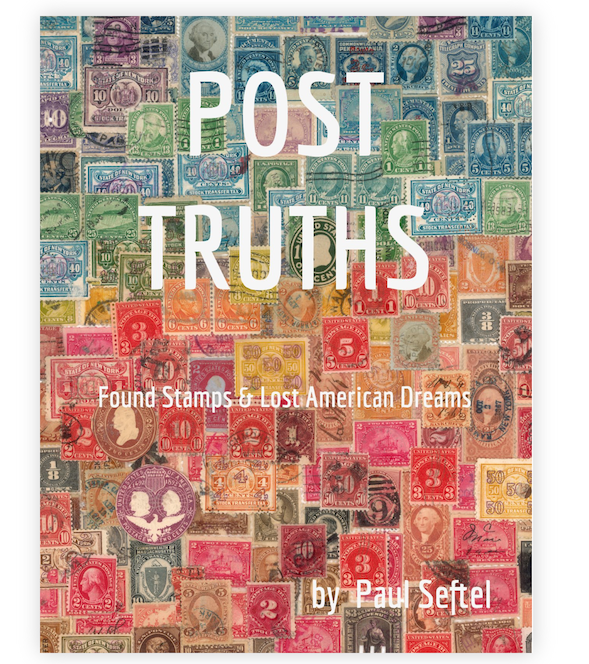 American history is seen through cancelled postage stamps. The arts of collecting, communication and propaganda come together in these found mediums and messages. This contemporary vision from the smallest of art forms was found by Artist Paul Seftel over the last decade. These post modern American dreams are like lost memories in cancelled messages, capturing a story from our grandparents sent to our future grand children. As an artist, producing Post Truth is my philosophical and revolutionary reaction to our lost civilization. Developing this survey of U.S. propaganda and postage stamps kept me sane through a particularly politically insane year in America. I hope that others will find some gold here, dig away and make maps from our collected past into our brave new world. Drawing together this hundred year survey of Post American dreams, the effects of time leap out of history as we watch the wheel of karma turn, and accept how we have created our stories. 2017 has been a time capsule of a year, and we’ve been watching our past and future merge into new and virtual realities. This age of Post Truth we’re living in raises unsettling view points, pushing at boundaries and exposing undercurrents of all kinds that have come to the surface now. Untampered with, it is as if they’d been sent from our grandparents to future generations. Letters, words and dates echo across the decades, leaping into the present from different states of minds away. Forgotten history, truth, irony and paradox huddle together, awaiting release in the catapult of time. 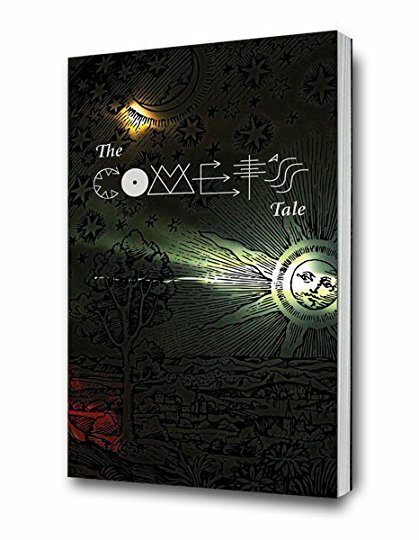 A cosmic voyage of self discovery, art, awakening and out of body experience beneath the Great Comet of 1996 the Comet’s Tale is about Earth technology, ancient prophecy, spiritual initiation and secret ceremonies. Riding the millennial fever, an art student voyages to the spiritual heart of the cosmos- the young traveler on a planetary quest at the end of Time. Old soul and young fool, he can’t deny the pull of tropical Java. A near-death experience on a Indonesian volcano draws him back to the New Mexico desert, mineral springs, caves and community, to receive visions enchanted by the natural elements and substance of a wild landscape. A rare voice and uncommon vision, the fiery traveler’s undaunted questing match the light and energy of the cosmic entity he grasps and finally rides through dust, vapor and vision. Heading East to West, space begins and new worlds are born; reality shifts shape, as multi-dimensional secrets are revealed in this ‘stranger than fiction’ meta-memoir.